Plastic Free July kicks off tomorrow!! What is Plastic Free July?? It's a campaign that was started in 2011 to get people thinking about plastic pollution. It's really similar to the zero waste movement, but they're only asking you to commit to a month of trying to avoid disposables. They have this darling little graphic on their site. The goal is to avoid disposables in the month of July. You can pick one disposable to avoid like single-use plastic straws. You can try and avoid the big four which are grocery bags, plastic straws, to-go coffee cups, and plastic water bottles. Of course, you can go all in and avoid all disposables too! Since it's only a month long commitment, you can get your toes wet and see if it's something you'd want to pursue long term. Plus it takes 28 days to make a habit.... ;) By then, you'll be so used to bringing your own to-go cup to the coffee shop, you won't even remember disposables exist. Head on over to Plastic Free July and make a pledge on what you'd like to give up this July. 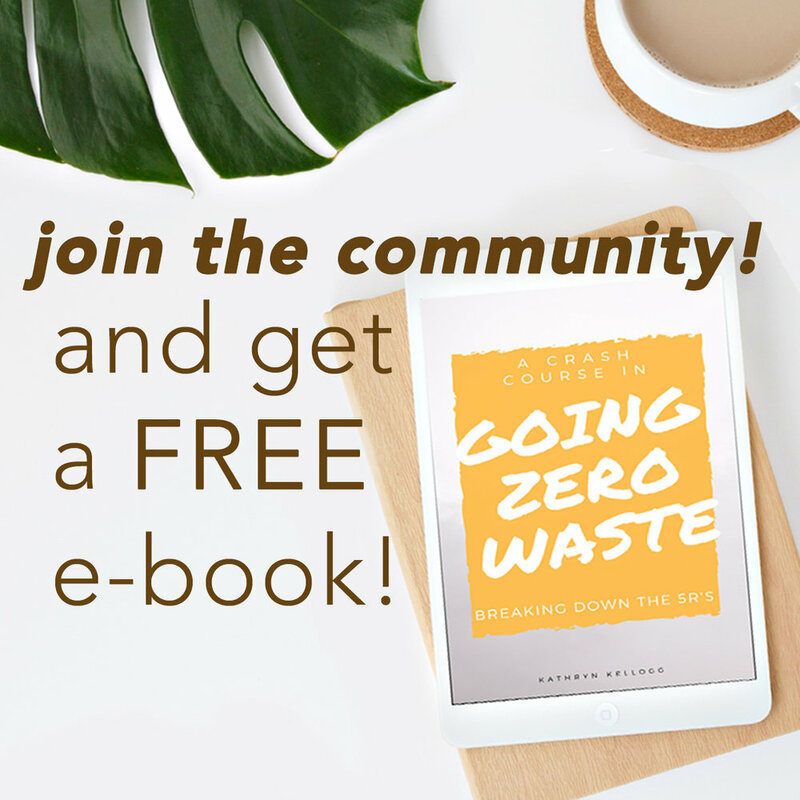 I highly encourage anyone to participate, but especially share it with your friends on the fence about zero waste living. If you've ever heard your friends say, "That sounds hard or stupid or time-consuming," have them pledge to give up one thing. They'll quickly find how easy, fun, and simple it is! Here are some of my favorite reusable items to swap out for the big four plastic polluters. Of course, if you have one of these items, you should use what you already have first! The good ol' reliable mason jar*. I use mason jars for almost everything. Check out my blog post for 13 unexpected uses. This multitasking powerhouse deserves a place in your cabinet. With its leak-proof lid, it's perfect to throw in your bag. However, heat transfers very quickly with glass. I would reccomend cold drinks like cold brew and iced coffee. Of course, you can throw a coozie* on your jar for hot drinks. If you know how to knit, you can easily knit one. Celia at Litterless sent me one for my birthday two years ago. I absolutely love it! I get my hot drinks to go at the coffee shop without having to worry about hurting anyone's hands. It also helps to prevent breakage. I've never had a mason jar break due to hot liquids being poured in one, but it can happen if the glass is compromised with a small crack. The keep cup* is a super popular option around the zero waste community, and I can see why... They're darling!! However, you cannot throw this into your bag. It's more of a walk and sip kinda cup. My mom gave Justin an engraved Yeti* tumbler for Christmas. He loves carrying it and getting his coffee to-go in the morning. He LOVES Blue Bottle coffee. It's definitely his vice when he goes into the city for school, and I love any reusable that Justin loves. Bag Podz* are my FAVORITE reusable bags. I cannot stress how much I love these. They're compact and easy to use. I can take one out and throw it in my bag, or if I'm going grocery shopping, I'll take the whole pod. I have 10 in my pod, and I never have to worry about not having enough bags. My mom has these trolley bags and she loves them. She uses them every trip. They can get pretty heavy to carry since there are only four. Our print shop is next door to a grocery store, so she buys groceries every couple of days and it's never an issue. I don't make it to the grocery store very often, so I would stick to the bagpodz. Don't forget about reusable produce bags* too! These are synthetic which is a bummer, but they're super light weight and the mesh has a very, very fine weave. They're see through and perfect for produce and for bulk items. Even small bulk items like rice! They weigh very, very little so there's no need to subtract the tare weight. I also have a whole bunch of these organic cotton bags*. The weave is quite a bit larger. You can get larger bulk bin items in these and produce. I think I've tried every type of reusable straw out there. Everyone has their own preference. I like the stainless steel* ones, they're super durable and reliable. Justin does not like the stainless steel ones. He says they taste too much like metal and he can't "see" the clean which bothers him. I have not tried silicone straws*. But, I think these would be great for children! I can definitely see how glass and stainless straws might be a little too scary to hand to a toddler. I love drinking smoothies out of bamboo straws*. It makes me feel like I'm on vacation. They do have a slight bamboo-y taste to them. I can't really describe it, but it tastes like summer vacation to me. I love to drink out of these in the winter. I think glass straws* take the ultimate prize though. These are Justin's and my favorite reusable straws of all. There's no "taste", they have a really good mouth feel, and most importantly: you can *SEE* the clean. If you're clumsy or prone to dropping glass like regular mason jars, a glass water bottle with a silicone sleeve* might before you. These are really durable. They're also really cute allowing for a little more personalization than just a basic stainless steel water bottle. My friend swears by her s'well bottle*. The only issue she runs into is getting ice into the opening. And, last but not least the bottle Justin and I swear by. Our handy dandy Klean Kanteens*. I found both of our kanteens at the thrift store for one dollar!! Always make sure you check the second-hand market first. Well, first check your house. Then check the second-hand market. If you're looking for more plastic free, zero waste swaps, check out my top 10 post. Have you taken the Plastic Free July Pledge? What did you pledge to give up?